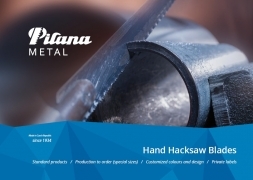 Our band saw blades are made from the best quality bimetal strip. This material consists of two kinds of metal: The alloyed spring steel creates the body of the band saw blade strip, a high speed steel wire is welded to the top of the body. When teeth are milled into the bimetal strip, the High Speed Steel material creates the tips of the teeth. After heat treatment of the band the tooth tips of bimetal band saw blade become very hard but the body of the blade stays flexible. Such combination of materials ensures the best mechanical characteristics of the tools: wear resistance, high flexibility and cyclic bending resistance. 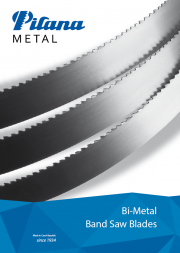 Why bimetal band saw blades? 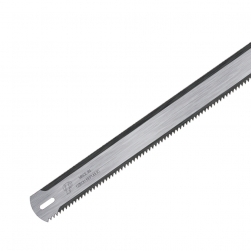 High flexibility of the band saw blade is necessary for long durability and best performance. The base body of bimetal band saw blade is made of highly alloyed spring steel, therefore it stays flexible even after heat treatment. 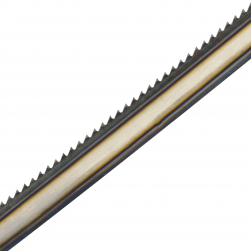 Tooth tips of our band saw blades are made of HSS grade M42 or M51. Its hardness equals 69 HRC and therefore our band saw blade guarantee excellent performance even in most demanding applications. Some characteristics are determined by the band saw machine and these are not to be changed by the user of the band saw blade. 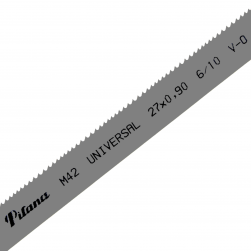 These basic characteristics are the width, the thickness and the length of the band saw blade. Other characteristics of the band saw blade are to be carefully chosen by the user of the machine: Tooth pitch, rake angle and width of setting. 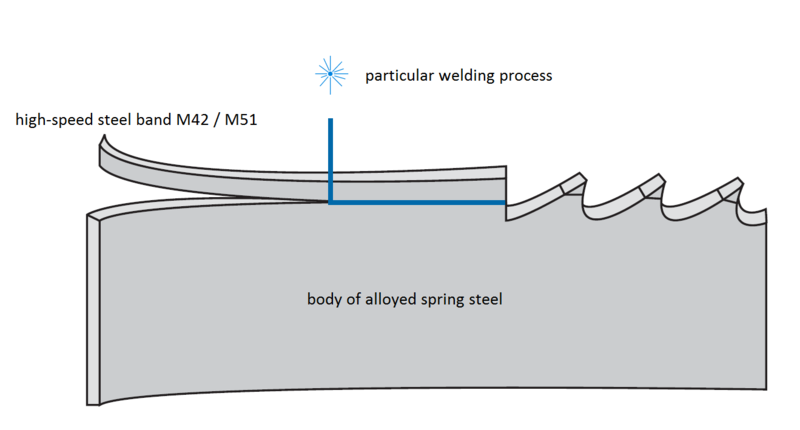 These characteristics could change in dependence on the cut material and cutting conditions, as they significantly affect the quality of the final cut. 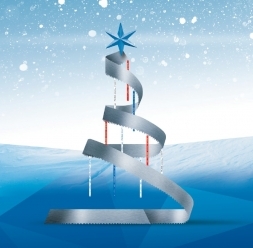 If you are not sure which type of the band saw blade is the best for your application, please contact our sales team. We will be happy to help you with your choice! 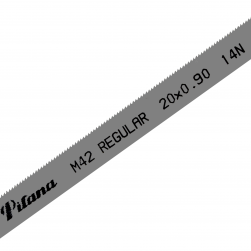 During cutting, the slot in the workpiece must always be slightly wider than the band saw blade – to reduce the friction between the material and the tool. This necessary widening of the slot is ensured by tooth setting (misalignment of the teeth to the side). Accuracy of setting is critical, as it significantly affects the cutting results. The most important principle is keeping constant width of teeth on both sides of the band saw blade. 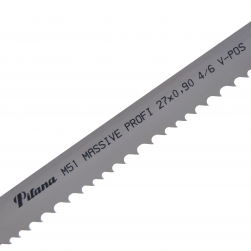 In the production of PILANA Metal the precision of tooth setting on our band saw blades is very carefully inspected. Using a CCD camera our machines contactlessly measure and control the setting of each single tooth on the produced bandsaw blades with accuracy 0.002 mm. Tooth pitch is the distance between the tips of the teeth on the bandsaw blade. TPI is an abbreviation for “Teeth Per inch” and means how many teeth are there on an inch long band saw blade. 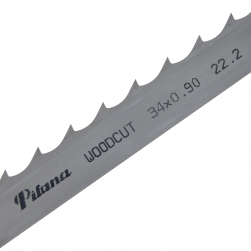 The pattern of the band saw blade consists of “groups”. A group has usually 7 teeth, which have variable distance between them (“variable pitch”). 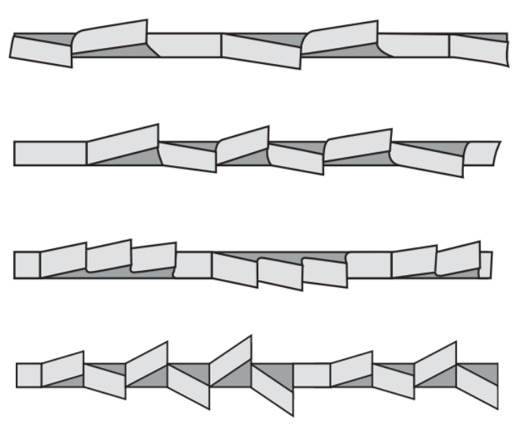 These groups of 7 teeth are repeating regularly on the whole length of the band saw blade. The variable tootch pitch is marked with two numbers A/B, (e.g. 6/8) - these numbers define the minimal and maximal tooth pitch in the group. Variable tooth pitch is often used when reduction of vibration is needed during cutting problematic pieces. Another reason for using a variable tooth pitch might be a need for more-purpose use of the blades. The band saw blades with variable tooth pitch are most commonly used in factories where profiles and solid materials are cut on the same machines and there is no possibility to change the blade for each material. 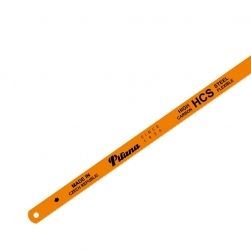 Materials of large diameters should be cut with band saw blades with coarse toothing. For workpieces with small diameter or for profiles, blades with finer tooth pitch must be used. At least two teeth should be in the cut at the same time. The smaller is the number of teeth in the cut, the better is the cutting performance (because the pressure distribution on less teeth means better ability for the teeth to get into the material). For soft materials (as for example aluminium or bronze) a smaller TPI should be chosen, because these materials need more space between the teeth for removing the chips. Otherwise the chip it would cumulate around the tool and will negatively affect the quality of the cut surface.